I went there in my capacity both as the drama reviewer for the Calgary Herald and as president of the Canadian Theatre Critics Association. My editors found it odd I would want to go to an international conference dealing with a topic – theatre criticism throughout the ages – that they saw as being distantly removed from Canada’s immediate cultural concerns. But I felt it would be interesting, perhaps inspirational, to talk with critics from places where theatre is taken more seriously than hockey or soccer. I had been writing about professional theatre for 12 years. I knew my editors were skeptical of Statistics Canada numbers showing that more Canadians regularly attended cultural events than professional sporting events. By going to this critics’ conference, I hoped to satisfy myself I was still on the side of the angels. We did our talking in a hotel ballroom on the eastern side of the Wall. 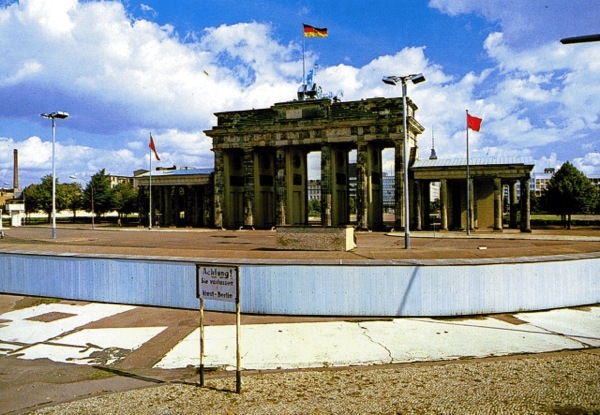 This serpentine partition of concrete and wire mesh had bisected Berlin for 26 years. 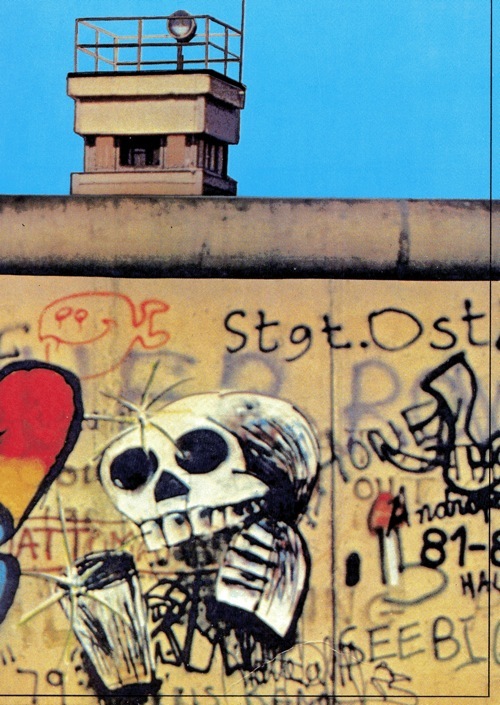 On the western side, nameless artists had daubed the Wall with graffiti and brightly coloured paintings. On the eastern side, the grey concrete remained pristine. Armed guards stood watch around the clock. They ensured nobody tried to scale the Wall or contribute unwanted artistic enhancements. I asked one uniformed sentry if I could take his photograph. He waved me away. I took a picture of the Brandenburg Gate instead. One critic went to extraordinary lengths to gain a seat at the conference table. Sajedul Awal, a freelancer from Bangladesh, told me he had spent five years saving for the trip from the proceeds of his part-time job as project coordinator for a poverty relief agency. When a transit strike finally threatened to scupper his travel arrangements, he walked the entire 80 kilometres from his village home to the Dhaka airport. “You carried your luggage all that distance?” I said. “In a handcart,” Awal replied. We didn’t find much common ground during our initial discussions. Critics from western countries maintained that the best kind of theatre challenged received wisdom and stimulated public debate. By “received” we meant untested, untried, repeated out of habit. Critics from the eastern bloc argued that the only worthwhile theatre promoted the ideals of the state. I had little to contribute publicly to the debate. I was there to listen and learn. But I was given an opportunity to say a few words about the cultural events planned for the Calgary Winter Olympics the following year. My presentation was nothing more than an orally delivered press release, yet a report appeared the next day in the East German national daily, Neues Deutschland. This surprised and amused me. I couldn’t imagine too many of the paper’s readers wanting to jump on a plane for Calgary to catch Ian Tyson and Gordon Lightfoot singing Four Strong Winds at the opening ceremonies. Some of the discussion topics were numbingly esoteric. One was titled, “From the aesthetics of the transient to the poetics of memory.” It served only to put theatre criticism on a plane far removed from such day-to-day Berlin realities as the machine-gun killings by border guards of would-be East German defectors. Other presentations, by contrast, suggested that in some countries the theatre could act as a force for social and political change. In the black townships of South Africa, the theatre offered the only officially sanctioned outlet for citizens who wanted to protest the evils of apartheid. In Ireland, the theatre underscored the madness of extremist violence. At the famed Berliner Ensemble, political theatre flourished in shackles while censorship prevailed. A traditional epic poem adapted for the stage by a contemporary East German dramatist, Volker Braun, depicted a character being stabbed in the back while crossing the German frontier. It wasn’t difficult to see this as an allegory of the dangerous journey taken by those desperate individuals whose unsuccessful escape attempts were marked by white crosses on the western side of the Wall. A popular parlour game among East German theatre audiences involved looking for the hidden messages in densely encoded works. A New York critic, Don Shewey, showed us how the theatre could still assert its ancient function as a public forum for community discussion. The best contemporary example, he said, was the theatre’s response to the then-unfolding AIDS crisis. Two plays, William Hoffman’s As Is and Larry Kramer’s The Normal Heart, had taken the lead in promoting public awareness of the deadly disease. This was at a time when governments and the mainstream press were slow to recognize the gravity of the crisis. The plays became big news in New York and later across North America. Productions were staged in many cities including Toronto, Edmonton and Calgary. In the process, the plays brought to the public at large the social, political and medical issues that previously had been discussed only within the gay community. I found Shewey’s presentation inspiring. This was what I had come to see and hear. Theatre at its most provocative could make the front pages of the newspapers and be talked about on the radio. Could something like this ever happen in Canada? In fact it did, about five years later. Calgary’s One Yellow Rabbit Theatre produced a satirical show, Ilsa, Queen of the Nazi Love Camp, about a convicted hate-monger and Holocaust denier named James Keegstra. A Red Deer judge, Arthur Lutz, ordered the theatre company to stop performing the show while Keegstra was being retried on a charge of willfully inciting hatred against Jews. The news of the judge’s ban, later lifted, went right across Canada. For the first time in living memory, a play became part of our national conversation. As I listened to Shewey talk about the socio-political impact of the AIDS plays on New York, I wondered too if the theatre’s potential as a vehicle for social change could ever extend to bringing down the Wall. At the time it seemed unlikely. 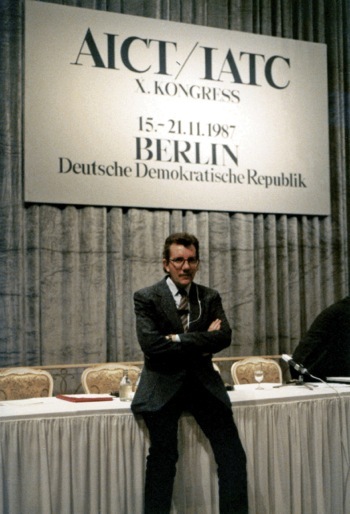 Although some dissident East German theatre artists such as Heiner Müller and Peter Zadek participated quietly in the movement that eventually led to the fall of communism in 1989, they never identified themselves publicly as agents of change. The ruling Socialist Unity Party demanded ideological compliance. All the talk among eastern bloc delegates at the conference seemed to suggest the political status quo wouldn’t be dislodged any time soon. Toward the end of the conference, when it seemed some of us would never agree on where to go for a good plate of liver dumplings, much less agree on how theatre could be made more relevant to our day-to-day lives, we suddenly set aside our ideological differences and endorsed a plea for world peace. Our statement came after we had visited the former concentration camp in Buchenwald where Nazis killed thousands of prisoners during the Second World War. Without world peace, we agreed, all this talk about the relevance of theatre would be just so much blather. I can’t claim any credit for crafting the statement. But I was happy to append my signature as the Canadian delegate: “We call on world leaders to remove the threat of future war from our midst, and reaffirm our belief that only peace is the necessary precondition for the arts to thrive.” England’s John Elsom, the president of our international group, suggested we release it to the world’s press. I expressed skepticism. I didn’t think any newspaper would pay attention to a peace petition issued by a bunch of theatre critics. I was wrong. At least one national daily, the ubiquitous Neues Deutschland, printed the statement in its entirety. On the front page. “Without censorship,” a Polish critic, Andrzej Zurowski, noted approvingly. Two years later, the Wall came down. I was grateful to have seen it at close quarters before it was finally consigned to the boneyard of history. I like to believe theatre artists could have played a role in its demise. The Wall may have divided but it never conquered.